The Las Vegas Quiltin' Bees is a freestanding independent organization not affiliated with any major local or state quilt guilds. The Bees are federally recognized as a non-profit organization; therefore, any donations of fabrics, books, or quilting items are tax deductible. 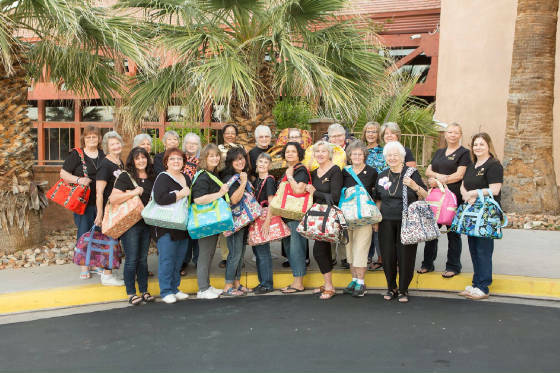 The Bees perform many community charity projects benefiting the Las Vegas area, as well as provide education and encourage the preservation of quilt making. Visit our other pages for information on our plans for the next few months. Meetings are normally held on the fourth Saturday of each month. We meet at the Hollywood Recreation Center, located at 1650 South Hollywood in Las Vegas. This is close to East Charleston Boulevard and Hollywood (on Sunrise Mountain.) We meet from 9:00 AM until 3:00 PM, or whenever we get tired of sewing! Visit our Calendar of Events and also our "Classes" page for details on upcoming events and classes. Remember, you are not obligated to do any of our projects, you can always come join us and bring your own projects to work on. But we encourage all of our members to come to each and every meeting, we do have fun! If you would like more information or are interested in becoming a part of our quilting group: Email our President, Kathy Melcic at KatherineMelcic@hotmail.com or stop by and visit our next class and get acquainted.